Here are some prayers for you to use if you are facing trouble in your marriage. I often find that having a prayer to refer to prompts people to pray more effectively for their needs. Read through the following prayers and see which prayer or which parts of various prayers best relate to your situation. Then use those thoughts to put together a prayer best suited to your needs. I don’t use scripted prayers and I don’t want you to be dependent on what others have written for you. But I know that people find it helpful to be guided in their praying until they gain confidence to make up their own prayers. If you have found some other prayers that really helped you then please send them to me so I can make them available to others. “Lord God, my Father, I cry out to you in my distress. King David cried out to you and you heard him, so I believe you will hear my cry too. I cry out to you for my marriage. I ask you to save my marriage and to bring my spouse back to right living and back to me. I ask you to completely set my spouse free from the sin and foolishness that led them away. I also ask you to save them from destroying their life. You did not create me or my spouse for sin and destruction, but you created us to serve and glorify you, powerfully. I ask you to grab a hold of our lives, turn us both around and set us on a course of serving you with all our might. And please bring your love and power into my life. While I cry out for my marriage, I know that I need more than just having my spouse back. I need your love and your grace in my life, so I can have all the peace, joy, love, patience, and those other things that you bring into a life. I want to be used by you to see lives completely transformed. So I need you to transform me and reveal your love and power in my life, so I can show others what you can do. Come and overflow me with your love. Come and lead me into a really close walk with you. Come and captivate my heart and fill my life with your glory. I want to know and love you better than I know and love anyone else. I want you to have first place in my life. Come and be lord and master of me, and also come and transform my marriage and my spouse, for your glory. “Lord God, You know that I have not been living the way You want me to. I have allowed myself to get tangled up in a relationship that does not honour You and does not bring the best for me or my children. I call out to You for grace and for wisdom. I want Your best in my life and I want Your best for my children. Please rescue us from this messy situation. Lord, I have allowed things to happen without really relying on You. I have let myself get into this present situation, and I did not really look to You, or trust You to protect and bless me and my family. Please forgive me for not totally relying on You, and for not putting You first in my life and in my home. Come into my heart, and into my home, and bring Your holy presence to clean up the messes that I have allowed to develop. Help me and the children to love you as the most important person in our lives. I pray for this other person in my life, who is part of my wrong choices. I want them to be totally sold out to You and controlled by Your love and power in their life, whether we have a future together or not. I ask You to bring them into the fear of God too, so they will want to live right before You. And lead us both into a proper sorting out of the way we live. May my home become a place where Your glory shines, and may Your glory fill my life, my home and the lives of my children. “Lord, you know my heart and you see my deep feelings and fears. You know that I am not happy with the way things are and I am insecure about the future. I am anxious about relationships and what might be ahead for me. Forgive me for not trusting You. Your word says that Your plans for me are only good, and that if you are on my side then nothing can prevail against me. So I bring myself back under Your care and protection, and ask for Your guidance and wisdom in my life. I also ask that You pour into me your Perfect Love, because perfect love drives fear away and banishes it. I want all fear driven out of my life. And Lord, please visit my inner thoughts and feelings. You know the things I struggle with better than I do. And You have answers that are more wonderful and powerful than anything I can get from a relationship, or from counsellors or from any other source. Come into my heart and heal me of those things that consume me. I don’t want to be trapped in selfish preoccupation with myself. I want to be free to bless others and to be blessed. I call upon You to be my deliver and I trust You to do, for Your glory. John the Baptist had an important ministry, in the footsteps of the great prophet Elijah, preparing his generation to receive Christ. John impacted the nation of Israel and far beyond. Decades after John’s death Paul met a group of devout followers of God at Ephesus who had been baptised with “John’s baptism” of repentance. At the same time an orator named Apollos travelled through many nations preaching John’s messages. Both the Ephesian believers and Apollos had to be brought up to date with the revelation of Jesus Christ as the fulfilment of John’s preaching. Yet for John’s message to have gone so far and wide we see that the impact of his preaching is quite impressive. 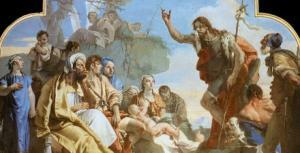 The Bible gives several insights into John’s preaching. First mention is in Matthew’s history of the life of Christ. Matthew tells us that John preached in the wilderness and the summary of his message is “Repent for the Kingdom of Heaven is close at hand”. Matthew also tells us John came in fulfilment of a prophecy from Isaiah. Matthew’s assertion that John fulfilled a prophecy from Isaiah is confirmed by Dr Luke, who did his own research into the life and Christ and recorded his findings in the gospel of Luke. Luke discovered that John’s father saw an angel which foretold John’s birth and said John would fulfil the very same prophecy Matthew records, see Luke 1:13-17 and also Luke 3:2-6. Dr Luke summarised John’s preaching as Matthew did, with a simple sentence, but adding detail Matthew did not mention. Six hundred years before John the Baptist the prophet Isaiah spoke about him and what he would say. Matthew declares that John is the fulfilment of a prophecy by Isaiah found at Isaiah 40:3-8. Isaiah gives a rich insight into John’s message, summarised by Matthew’s simple account. We see that John was to preach in the wilderness, which Matthew recorded happening. John would also “prepare the way of the Lord”, by getting the people ready to receive Christ, which the gospels record taking place. The preparation for Christ was to involve making a straight path, lifting up the lowly, humbling the proud, removing the deviations and the bumps. John’s simple and direct message levelled the field, directing all the people, great and small to take the same step of repentance. I love the prophetic account given by Isaiah about John the Baptist’s ministry. The New Testament historians don’t give any insight into how this prophecy was fulfilled, so let me bring it to life for you as I see it. At this point I see John standing in the wilderness, alone. How many other people are going to be in the wilderness? None. Only lost shepherds and crazy people are hanging out in the wilderness, unless maybe someone is on their way to the Qumran community at the top end of the Dead Sea. John’s voice echoes across the scrubby landscape. And off in the distance one or two lonely souls hear him preach and are immediately gripped by the Holy Spirit. They are cut to the depths of their heart and hurry home to get their friends and family to come and hear this voice. So powerful was the message, given in obedience to the Holy Spirit, that an audience quickly grows as people hungry for God are gripped by this simple, humbling message. Isaiah was not the only one to prophesy about John the Baptist. Four hundred years before John the prophet Malachi spoke of one coming in the spirit of Elijah to impact the hearts of the people. We know that John is connected to this prophecy because of the angel that spoke with John’s father. You will note in that angelic message that John fulfilled the prophecy given by Malachi. Recognising that each description of John’s preaching and ministry is in itself a summary, but that each should be complimentary, we can now put them together to create a picture of John’s preaching. John was a voice crying in the wilderness, so he did not start with a big city crowd. He had to build an audience in a place where an audience was hard to come by. And he did. He did it by preaching what the Holy Spirit told him to preach. The message humbled man, exposing man’s temporary and meaningless existence. The message also exalted God, by showing that God’s Word endures and cannot be changed. John’s message called for repentance by levelling all humanity before God, all with the same need to repent before God. John introduced a new expression of humility, that of baptism by immersion to testify to a change of heart. John’s message focused people on the Kingdom of God, which has two points of significance. The presence of God challenges our sinfulness before Him, calling us to repent and seek forgiveness for our sins. For those who have found that forgiveness, the presence of God promises God’s blessing and grace in their lives. The depth of repentance called for by John prepared people to accept Christ. It also changed their heart, not just to God, but toward those in authority and those they are responsible for. A modern day John the Baptist would still preach the same message. A modern day John would not start out with a big audience, but with a Spirit anointed message. He would speak with such destiny that the message would do the job. He would not buy and audience or rely on marketing hype to get heard. And a modern day John would expose in people’s hearts their pride, rebellion, selfishness and independence. He would call them back to living the way God wants them to, rather than for their selfish, secular agendas. John Baptist’s preaching moved a nation. His message was “Repent, for the Kingdom of God is at hand”. Today that would be “Repent, for God is right here, so fear God and expect God’s blessings”. The significance of John’s sermon is endorsed by the fact that Jesus Christ took up that same message when He began to preach. This is the message destined to prepare hearts for Christ. This is the message that Jesus preached. And this is the message that the early church preached as well. Paul the Apostle reminded the church leaders in Ephesus about his preaching that had built that church years before. Just as John called people to repent, so did Paul. The Kingdom of God being at hand was the basis for repentance. Because God is real and is present to deal with us, we must have repentance toward God, but we also have great reward in our faith in Jesus Christ. As I summarised it above, the message is, “Repent, for God is right here, so fear God and expect God’s blessings”.